Spring 2 - Can we trust our machine analyses? 'Keeping ECGs Simple' is an educational blog which runs alongside Twitter. A new ECG case "quizz" is launched most Wednesday evenings in term time, via @ecgclass, and a conversation/discussion around the case evolves on #ECGclass during the course of the evening. Don't forget the follow the hashtag for the updates during the course of the evening! Cases are generally aimed at Primary Care. All scenarios are completely fictitious, but based on commonly occurring presentations in General Practice. Today we're doing a confidence test. Will you challenge your ECG machine? It's Saturday morning and your Practice flu-clinic is in full swing. Let's look the recordings, one by one. Assuming they all each fulfil the CHA2DS2-Vasc criteria for treatment, and have no contraindications, who are you going to initiate on anticoagulation and rate control? The machine says this is AF. Not AF - Ignore your machine - P waves are clearly visible. P waves are clearly visible, but don't have a consistent relationship to the QRS. i.e. The PR interval is variable. Starting with the 3rd complex on long lead II: This QRS complex is preceded by a P wave, but the PR interval is prolonged (>5 small squares). The following complex has an even longer PR interval. The P wave of the subsequent complex is so premature that it is lost in the previous T wave. (Note the distorted shape of T wave). This series of 4 complexes is then followed by a pause, before the cycle repeats itself. b. If not, what it is? 2a). This is Not Sinus Rhythm - Ignore your machine! 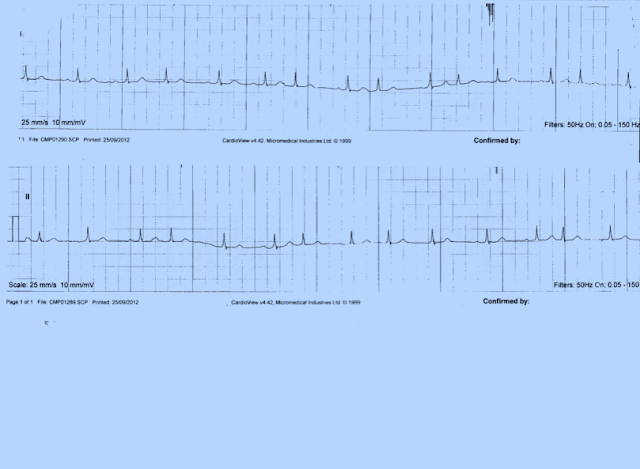 Neither has this patient got ventricular trigeminy, multifocal extrasystoles (that's bizarre pattern in the rhythm strip is probably movement artefact - seen in a limb lead but not mirrored in the chest leads), nor a short PR interval (un-measureable without P waves). 2b). Can you see P-waves? If you are ever uncertain about P waves, look carefully at V1 and V2 - these are the two leads in which P waves are usually best seen. I can't see them on this ECG. The rhythm is irregularly irregular. You guessed it. This is barn door AF - missed by the machine. Now this is a bit more tricky. You definitely need an element of suspicion, and a piece of paper to map the complexes here. 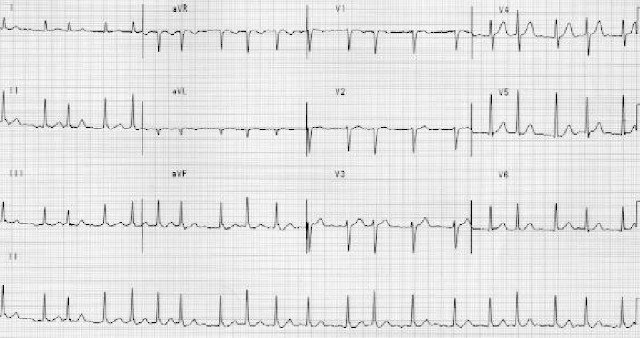 This is infact atrial flutter with variable atrioventricular conduction, with cycles of both 2:1 and 3:1 AV conduction being present. The flutter waves are positive in II, III and aVF which suggests that this may be a “clockwise” atrial flutter. The flutter cycle length is close to 200 msec, and the flutter waves can be seen lining up close to each major grid line in lead V1. The patient should be anticoagulated and considered for atrial flutter ablation. 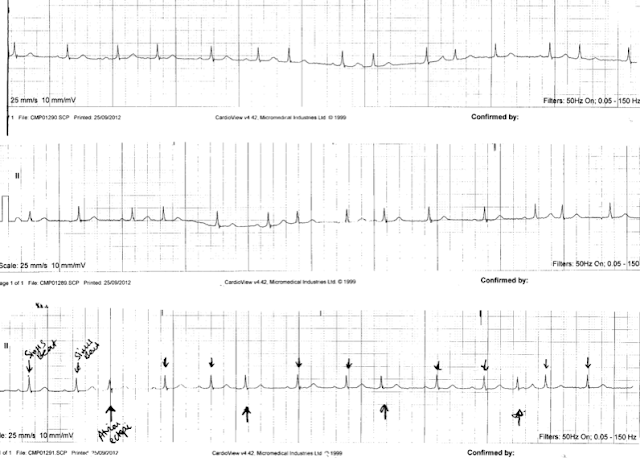 An ECG rhythm strip with carotid sinus massage or adenosine could be used to confirm the presence of flutter non-invasively when there is doubt. The LVH suggestion is also believable (voltage criteria met in Lead I, and possibly aVL - see earlier blog on LVH). 4a). This is NOT AF. Like many of you, when I first looked at this ECG, I was quite confused. It's not an easy one. The machine's 'AF diagnosis' made me question myself. I considered an altering PR interval, perhaps Wenckebach, but just wasn't happy with any of my thoughts. To make it worse, we asked the patient how she felt (crazy thing to do, I know…;)) - she admitted that the previous night, she had an episode when she felt quite light headed, dizzy with a short burst of palpitations. The 1st QRS seen, looks quite normal, and is preceded by a normal looking P wave. The 4th and 6th complexes, likewise, look normal. The 2nd complex, certainly looks like an atrial ectopic. 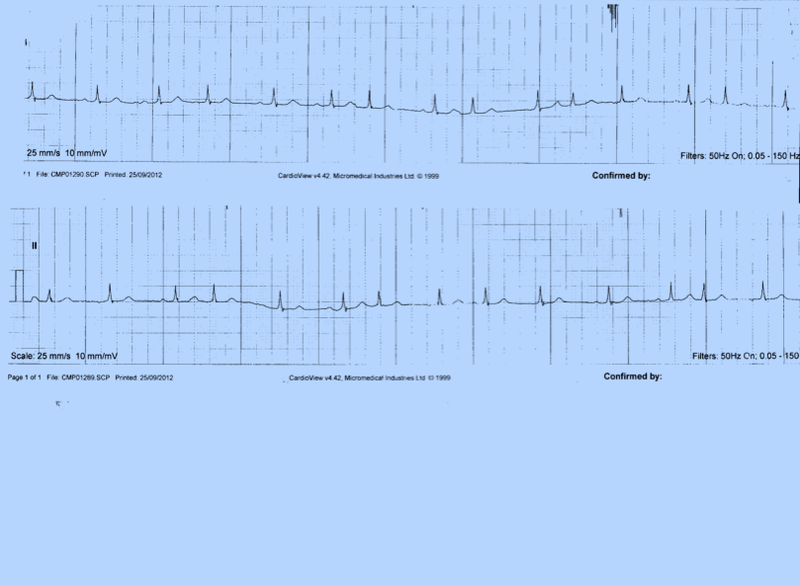 So, on this ECG alone, we can see lots of different patterns of atrial activity. This could be something called Multifocal atrial tachycardia. This is often seen in people with poor lung function, such as severe COPD. Multifocal Atrial Tachycardia is characterised by an irregular atrial rate greater than 100 beats per minute, with at least 3 morphologically distinct P waves and irregular P-P intervals. It is often short-lived and self-limiting. Any underlying condition, such as respiratory failure is the mainstay of treatment. Rate control is not important, and may in fact make her feel less well. It does however show more 'normal' P waves, and more frequently associated with a normal QRS complex. Also, as she has relaxed in the waiting room, her rate has come down, so it's no longer an atrial tachycadia - multifocal, or otherwise. But sometimes, a long rhythm strip just isn't long enough. So, lets see a bit more…. This just goes to show how helpful rhythm strips can be if you wait long enough! We can now see, at last, a background rhythm. The first two beats are sinus beats, followed by an atrial ectopic. This is NOW a clear Atrial trigeminy rhythm. Now we have the benefit of this knowledge, we can more confidently assume that the previous strips seen, just represent a mixture of atrial ectopic activity. There is frequent premature atrial activity, but whenever there is a prolonged pause, an atrial escape beat (compensatory beat) kicks in. The rest of the time she's in Atrial bigeminy. This doesn't need any further action or treatment. She's well in herself and can be reassured that this is often seen in her age group. However, patients with this kind of rhythm, do have a higher tendency to progress into AF in the future. So it's wise to remain vigilant. The main learning point here is - once again - REMEMBER TO IGNORE your ECG machine's interpretation! Had the clinician here just glanced at the report, and not the trace, an unnecessary referral - and possibly inappropriate treatment - may have been initiated. YES!! This is AF. Just popped in to remind you how straight forward it is to spot AF! So why can't the machines be as reliable as you? Well done everyone. Shall we have a quick and easy one next week? Thank you all once again, for your fun and input on Twitter. This delightful 84yrs old man comes to see you in surgery. Amongst other things, he mentions some chest pains. His symptoms are a bit vague and non-specific. He’s been having them for 6yrs. They don’t sound cardiac, but you know him well, and know he has a history of IHD. He’s not a fit man, but on the other hand, he’s not clinically unwell today. He seems much the same as usual. A long with his known IHD and CKD5, he’s also pretty immobile from his osteoarthritis and obesity. He seems a bit breathless today, as usual. You think … this could be anything! He has a lot of potential problems. You note from his recent annual review blood checks, that he has chronic stable anaemia (Hb10.5ish for many yrs) secondary to his CKD. His renal function is poor but stable (eGFR is 10-12). You decide it might be wise to get an ECG whilst you consider how best to take this forward. Now what shall you do? Are you any the wiser? Lets look at the ECG methodically and see if it helps. All ECG’s can be analysed with a few simple methodical rules. If in doubt, just describe what you see. Q1. Is this a regular or irregular rhythm? Q2. 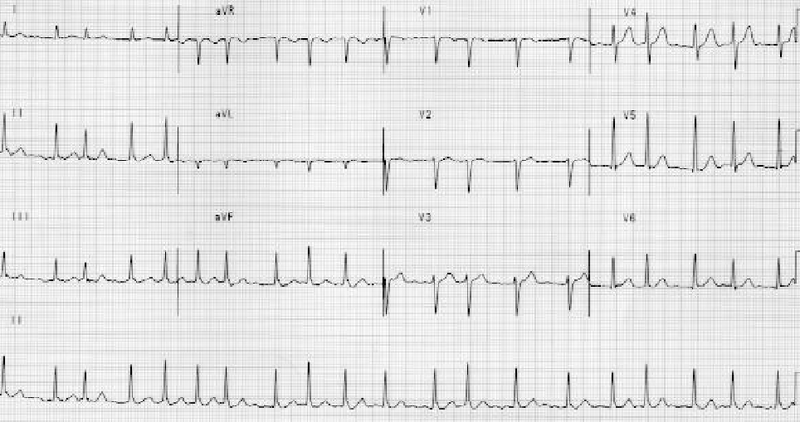 What is the rate of this ECG? Q3. Are there any P waves? Are they obvious? Perhaps hidden in other waves? Or simply non-existent? Do they have a consistent appearance? Do they have a consistent relationship with the QRS? Are they consistent in all leads? What is the duration of the QRS complex? A normal QRS complex should be no wider than 1 and half to 2 and half squares (0.06 – 0.11 seconds). Q5. What is the cardic Axis here? Is there any axis deviation? Q6. What are the common causes of Left Axis Deviation (LAD). Always comment - Is this a regular or an irregular rhythm? Best seen by studying the QRS complexes in long lead II in this case. (If there is no rhythm strip on a 12 lead ECG, you may only have 3 complexes to study. If so, regularity can be very difficult/impossible to determine). The rate has already been calculated for you at 52bpm. For regular rhythms: Rate = 300 divided the number of large squares between 2 complexes. I can just to say see P waves in the chest leads v1-6 but they are subtle! Because of poor quality baseline, I can’t see them in the limb leads or rhythm strip. Always comment on this if you see in in an assessment! 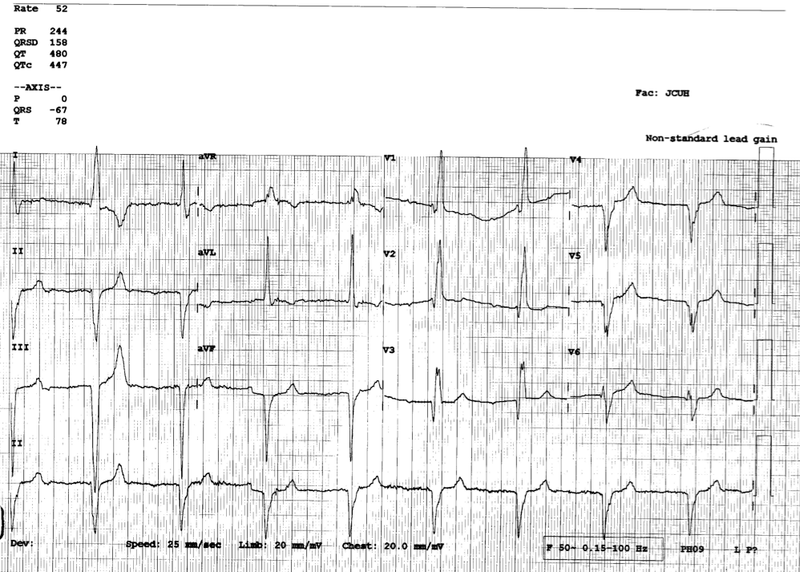 On his original ECG I couldn’t be sure if he had P-waves or not. If there were no P-waves, then this would be a ventricular escape rhythm ie. No atrial activity seen, and the ventricles have helpfully responded by setting up their own pacemaker focus somewhere within them. Of the few P-waves we can see, their shape is uniformly round. They appear to be upright in V1 but possibly inverted in v2-6. Not important for purposes of this lesson. SO, FOR A STARTER, THIS ECG SHOWS A REGULAR RHYTHM WITH 1ST DEGREE HEART BLOCK. Now we need to study the QRS complexes. We’ve already decided they are regular. We can’t really comment on the size, because we now know that the gain has been increased. 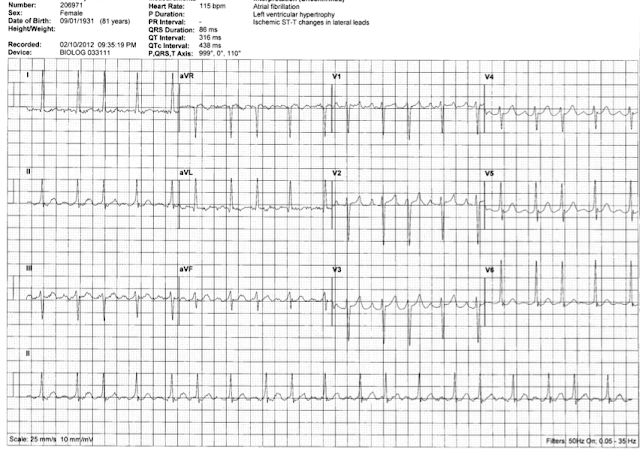 So there’s no point thinking about LVH on this ECG. We can consider their shape, and the Cardiac Axis. A normal QRS complex should be no wider than 1 and half to 2 and half small squares (0.06 – 0.11 seconds. In a heart with a healthy conduction system, once the impulse passes through the AV node, it travels through bundle of His, and down the Left and Right Bundle branches. 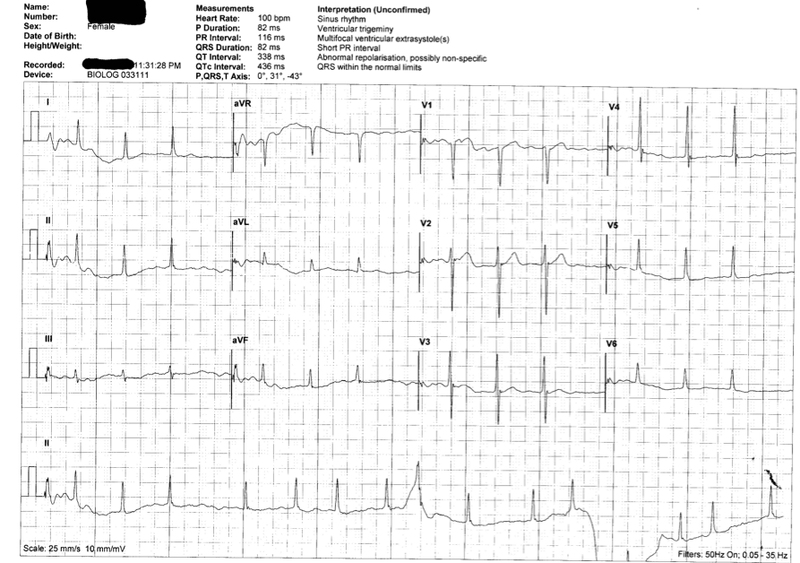 As long as there is no delay in this conduction, this gives rise to a narrow QRS complex (less than 3 small squares). 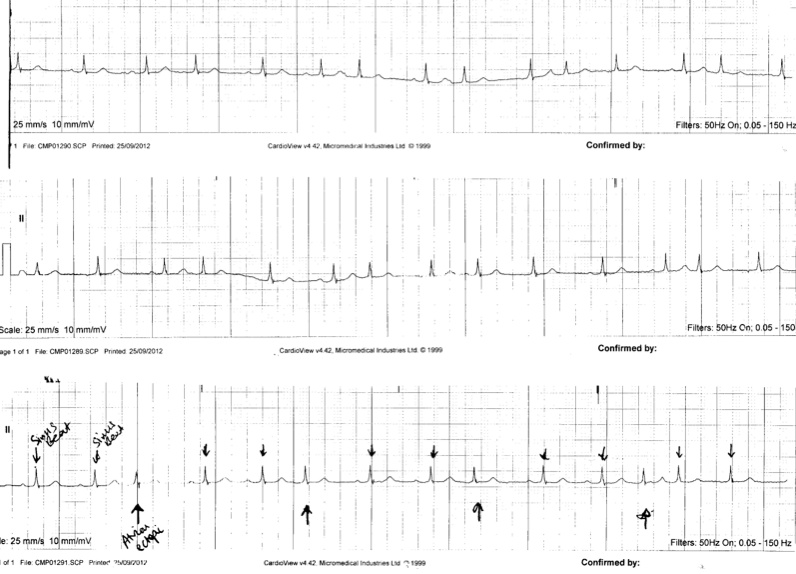 If, however, after the impulse reaches the Bundle of His, there is any delay in the conduction, through either the Left or Right bundle branch, then the QRS complex will be widened. LBBB usually gives rise to a wider QRS complex than RBBB. Whereas, in RBBB it is often ≤ 3 small squares. If we go back to the ECG in this case, we notice that the QRS complexes are slightly broad, with RBBB formation. NOW WE KNOW, THAT THIS ECG SHOWS A 1ST DEGREE HEART BLOCK, and A RBBB. a Left Axis Deviation here. RBBB alone would not normally alter the cardiac axis. 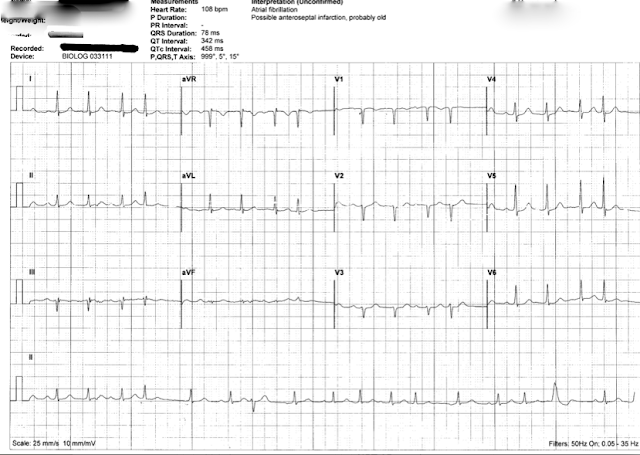 He is of slim build and from his original ECG (with standard gain) I can confirm there was no voltage criteria for LVH. Those certainly look like deep pathological Q waves in the inferior leads (but don't forget about the increased gain). We know something is going wrong in his conductive tissue. In the normal conducting system, the Left Bundle branch divides into two – the Anterior fascicle, and the Posterior fascicle. If both fascicles are blocked, then it becomes a full LBBB, but if only one fascicle is blocked, this is known as a “Hemiblock” or “Fasicular” block. A Left Anterior Hemiblock (Left fasicular block), will always cause a LAD. 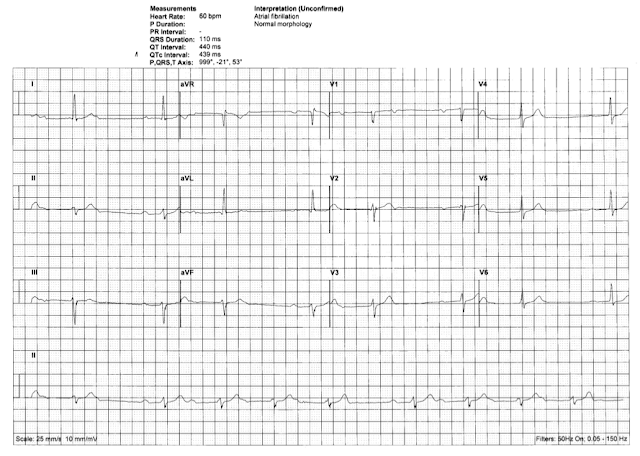 If you ever see RBBB + LAD, on an ECG, then you almost certainly have a LEFT ANTERIOR HEMIBLOCK. In fact, he is relying entirely on his small posterior fascicle, of the left bundle branch for ventricular conduction. If that fails him, he’s in trouble. Unsurprisingly, an ECHO revealed severely reduced LV systolic function. He needs a full cardiology assessment and consideration for pacing. See all your discussions summarised next week, on Storfiy, for you to keep a copy. Welcome back everyone to another year of interactive ECG learning. I hope you've all enjoyed a lovely festive break, and wish you all a Very Happy New Year. Hopefully you all feel charged up and ready to fire off on a whole new year of #ECGclass!! Over the the Christmas period, I'm delighted to welcome the many new-comers to the @ECGclass Twitter feed and hope you all find it helpful, and relevant. So what is #ECGclass all about? For the benefit of those who are new, here is brief outline of how the two component sites weave in together. The aim of this blog is to improve confidence in ECG interpretation, and to encourage more doctors, GP's in particular, to 'have-a-go'. We need to keep the art of ECG interpretation alive and kicking, and remember always, how unreliable digital machine analysis can be. Keep it simple. But safe. There is already a wealth of excellent blogs and social media outlets, for the more acute-care ECG interpretation (all that really clever stuff ). The intention is to keep this site purely for those every-day-ECG's which are thrown in front of us in General Practice, by our diligent Practice nurses. Which of those "incidental" ECG's do we need to action? The blog assumes a basic knowledge about heart anatomy, its conducting system, and the views obtained by a 12 -lead ECG. #ECGClass is an interactive discssion on Twitter. The Twitter account profile '@ECGclass' is used to launch the case and subsequent discussions, using the hashtag #ECGclass. A new ECG "quizz" is launched most Wednesday evenings, in term time. On alternate weeks, a summary of the previous week's interactive Twitter discussion is archived on Storify.com for reflection and review (links provided after each case). Of course, the www.KeepingECGsSimple.co.uk blog is always available for future reference also. If you feel confident enough to join in, that's fantastic, but equally its great if you just prefer to watch and learn quietly. Please feel free to leave any comments on the blog - It's really helpful to know how many people are 'out there', finding this class useful. And don't forget - I'm always looking for guest bloggers to help not only, spread the workload, and keep the class alive, fresh and sustainable. For the last 2 years, the @ECGclass 'team' has comprised……well…...me. But 2014 brings new excitement! There is already have a handful of guest bloggers in the pipeline, to bring fresh ideas. Skilled clinicians, ranging from final year Medical Students, to experienced Lecturers, and Cardiac Physiologists….are all lined up. So watch this space! More about the new "team" members in the coming weeks. The more the better, to bring diversity to the class - So if you feel you'd like to get involved with basic ECG teaching, or have some interesting ECGs to share please do let me know. Feel free to contact me via the blog, or DM me on Twitter via @ECGclass or @hcwetherell.